To the Editor: We describe a case of severe iatrogenic transurethal resection of the prostate (TURP) syndrome associated with confusing irrigant fluid packaging. TURP syndrome is described, as well as steps taken to request industry to alter the packaging. A 67-year-old man presented to Groote Schuur Hospital with acute-on-chronic urinary retention. Following catheterisation, benign prostatic hyperplasia (BPH) was diagnosed and elective transurethral resection of the prostate (TURP) was planned. The TURP was completed in 40 minutes with 30 g tissue resected. At the end of the procedure TURP syndrome was suspected when the patient became confused, bradycardic and hypotensive. It was discovered that sterile water (15 l) had inadvertently been used as irrigant instead of mannitol. The patient developed massive intravascular haemolysis, progressive disseminated intravascular coagulopathy (DIC) and cardiovascular collapse. Of interest is the fact that severe hyponatraemia and fluid overload were notably absent - features that distinguish this from mannitol-induced TURP syndrome. He required intubation, ventilation and inotropic support in the intensive care unit. He was transfused continuously with packed cells, fresh-frozen plasma and platelets for approximately 12 hours before the haemolysis and DIC abated. Despite his critical condition, he recovered well, was discharged home on day 7 without any permanent sequelae and is voiding satisfactorily. 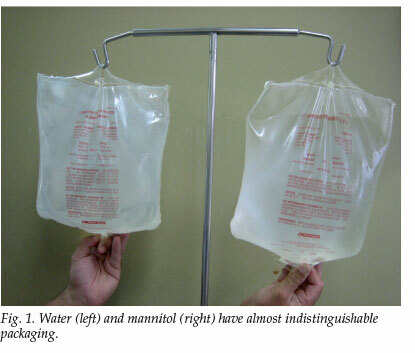 The iatrogenic confusion with the irrigant solution relates to the fact that the product packaging of water and mannitol is nearly identical (Fig. 1). Clinically the typical isotonic mannitol-induced TURP syndrome presents with neurological disturbances (92%) and/ or cardiovascular instability (54%).1 Dilutional hyponatraemia is a common biochemical manifestation. Hypotonic fluids (as erroneously used in this case) may lead to life-threatening haemolysis. Treatment of TURP syndrome relies on early recognition followed by coagulating any bleeding and stopping surgery thereafter. Intravenous fluids are discontinued. Arterial blood gas, serum sodium and haemoglobin are checked. Cardiorespiratory support is administered as required. A variety of measures have experimentally been recommended to reduce the incidence of TURP syndrome (e.g. ethanol breath test, intraprostatic vasopressin, etc.). Some alternatives to standard TURP are commercially available locally and eliminate the danger of TURP syndrome such as laser prostatectomy or bipolar TURP in saline. The manufacturer of the fluid was approached to request a change in irrigant fluid packaging identification. They have given us a written undertaking that the colour of their water, saline and mannitol packaging will be altered. In the 'Guidelines for CPD accreditation of the South African Society of Medical Oncology' by Abratt et al, which appeared on p. 729 of the October 2003 SAM], the second author's name should have been R W Eek and not R Eele.